Can I get an Amen? Who doesn't like a little bling? I thought this was a super fun little sentiment and I couldn't wait to use it along with a die cut diamond. Both the die and the stamp were designed by Julie Ebersole and are available at Ellen Hutson. Be sure to take a look. I love the way the gold card stock really shines. 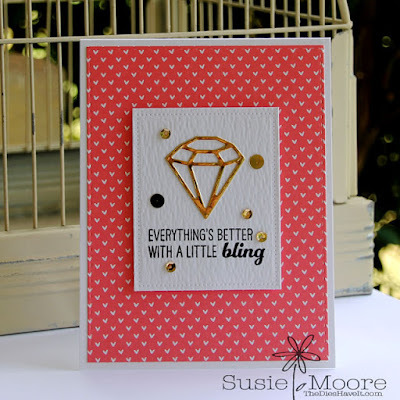 And of course I had to add a few gold sequins from Pretty Pink Posh to complete my card. Have a wonderful day and I'll see you right back here tomorrow!